Can Buddha Help You Lose Weight? When you think about Buddha or Buddhism, you probably don’t think about nutrition or weight loss. I know I didn’t. 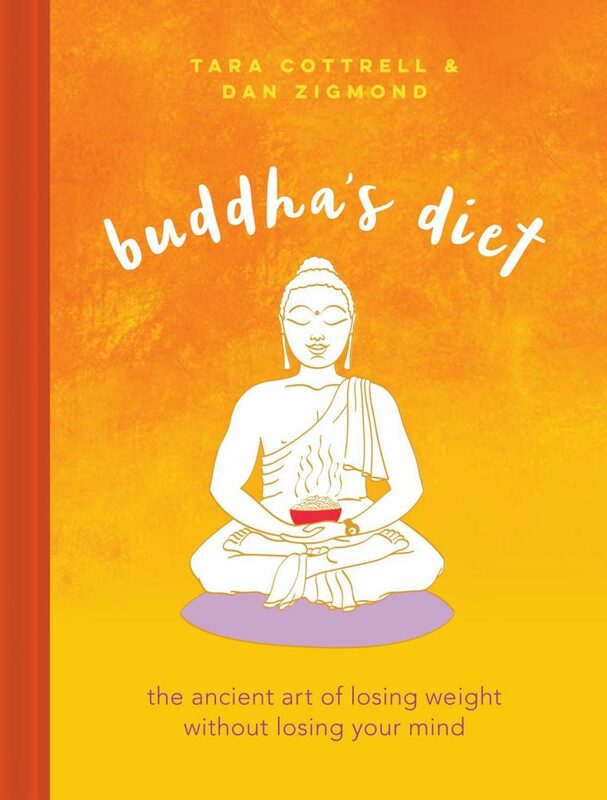 Co-written by Facebook executive and ordained Buddhist Priest Dan Zigmond and Stanford University executive/mom Tara Cottrell, Buddha’s Diet: The Ancient Art of Losing Weight Without Losing Your Mind, goes deep into what Buddha thought, did himself, and recommended to his monks in regards to food, exercise, weight and work/life balance. Unlike a lot of weight-loss books that leave out the mental aspect of losing weight, this one is heavy on it (as you might imagine) but in a really approachable and non-secular way (as you might not have imagined). Like, Buddha is cool, yo. Totally relatable. And fun to read about. And he has some really interesting healthy living advice that I haven’t heard a million times before. Yes, there’s pretty commonsense advice like do activities and exercise you love, don’t drink alcohol (although the authors let you fudge on that a bit), be mindful about your hunger/fullness levels, sleep, and manage your stress, but there’s also a whole chapter on timing your meals to be more like Buddha. Apparently, Buddha and his monks only ate between noon and dusk. Which, is a lot of time spent not eating. But turns out he was on to something. According to the book, studies in rats (and there’s actually a great argument in the book on why rat studies are important for understanding weight-loss — rats are way more reliable in tracking food and much easier to control than humans) show that people actually gain less weight when they don’t eat at night, even when they’re eating similar amounts of calories and getting exercise. No one is really sure exactly why that’s true (circadian rhyhtms are the most common current hypothesis), but seems like Buddha knew what was up. I can hear you saying right now: You want me to not eat from dusk until noon? That’s just crazypants unless you’re actually a monk. Yes, it is, I totally agree. And so do the authors — which is another reason why I love this book — they take the best of Buddha’s lifestyle and adapt it to modern peeps today. Instead of fasting for 18 hours, they suggest going from 7 or 8 p.m. to 7 or 8 a.m. without eating. And then, once you’ve mastered that (and assuming it feels good), you can tack on another hour. And then another. (The most restricted they’ll take you to is a 9-hour eating window.) They have a whole gradual plan and process that you go through to do it. It’s all very loving and self-directed. There are also great sections on cultivating gratitude, making peace with your body and forgiveness (including telling the time of when Buddha — pre-enlightenment — was a total, in their words, “jerk”). I’ll still stand strong in saying that weighing yourself every day is too often (sorry, Buddha), but there is A LOT of great stuff in this book. You’ll learn about Buddha, get some new tricks and tips for losing weight, and just smile. The book is plain fun to read.